Many of these posts talk about network functions virtualization (NFV) rather than software-defined networking (SDN). NFV is a subset of SDN that is more specific, and it is applicable to a higher level of the application stack. Whereas SDN is aimed at the network layers, NFV is aimed at manipulating the data. The idea of NFV is to take the functions that traditionally would be a part of the network and move them into the compute stack. This move gives us many abilities that we wouldn’t have if the functions remained isolated from the compute. It also lets us move to a much simpler underlying network that is capable of moving traffic around much more quickly. This article aims to examine the different parts that NFV encompasses and to discuss what we gain. The first, simplest, and most obvious function to virtualize is the switch. 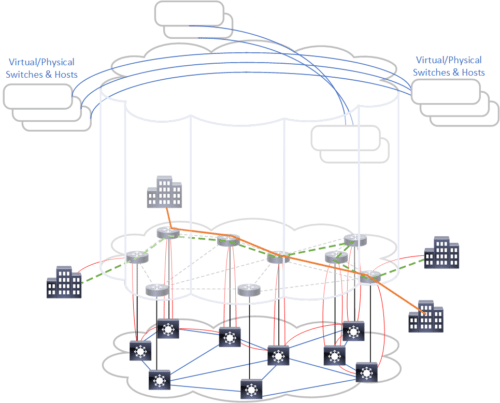 At the most basic level, we can’t virtualize servers without also virtualizing their connectivity. While we could in theory pass all of the traffic for all of the virtual machines to an external switch directly, we would not be able to differentiate between the traffic on the way back to the VM without something inspecting the traffic. In effect, we must have half of a virtual switch, so we may as well have a full one. The virtual switch, then, gives us the ability to avoid hairpinning traffic between VMs in the same host out to an external switch. We can move VLAN tagging and some QoS functions into the server, meaning that top-of-rack switches don’t need to do this grunt work. Virtual switching is an integral part of all hypervisors. The big story of the last few weeks has been Dell’s $67B acquisition of EMC, and with it, VMware. This is big news for the industry—news that will have ramifications all over the software-defined data centre. One of the most interesting implications is how Dell will reconcile its own SDN strategy with VMware’s NSX vision. Do the two work together? VMware paid $1.2B for Nicira. With currently around 400 customers, as reported by VMware, and roughly one in four of those running in production, NSX is a relatively small but highly lucrative gem in the crown jewels of VMware. Dell will want to see something come from that aspect of this acquisition. Since Dell acquired Force10 in 2011, it has had a stable of network offerings, though perhaps not with quite the clout of the more focused network vendors. Dell runs 3 to 5% of the switching market, depending on whom you ask. Dell gives those enterprises that want it a one-stop shop, with switch and router options at every level, from unmanaged modular switches to line-rate chassis switches right through the 40G and 100G space: options that rightly complement its server and storage offerings.